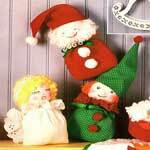 Make one of these cute elves this Christmas using one of these five sewing patterns. How cute to have an elf you made yourself sitting by the Christmas tree or to give as presents. This adorable little elf sits on a shelf up high and watches the children to report back to Santa on if they are naughty or nice. 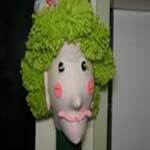 Find all the instructions needed for making this colorful advent elf that has twelve pompoms for hair. 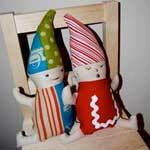 Gather up the kids for a fun holiday project of making elf dolls. 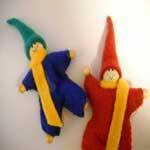 These dolls can be placed on the tree, inside a stocking or anywhere you want them. 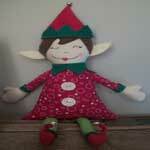 With some socks, fabric and a few other supplies, you can easily make one or several of these adorable sock elves. 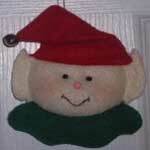 Here is a simple pattern for a little elf doll that makes a great gift for baby or toddler and can be cuddled all year long. Follow these eight steps and make this charming little elf ornament that you can personalize with a name on the collar. Great for babies first ornament.